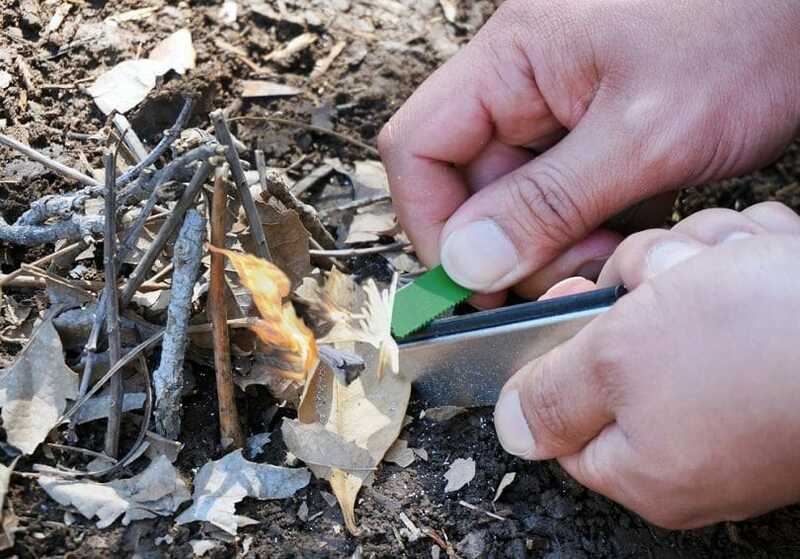 If you’ve been on more than few camping trips, then you’re probably aware that starting a fire isn’t as always as easy as it may sound – sometimes, you could use the additional help of the all-mighty fire starter! But have you tried finding a product you can rely on and got stuck in the sea of million choices? Even though there are many products featured on the market, not every product works well for everyone – and you wouldn’t want to be left hanging with a bad fire starter in the middle of nowhere, right? That’s why it could be for the best if you’ve learned a few things about important features before heading out to get your next fire starter. No matter whether you’ll be adding the fire starter to your backpacking gear or use it only as a backup option in your survival kit, we’ve taken the time to go over the most basic features so you could decide for yourself what might work best for you. We sincerely hope that the buying process will become easier for you after reading this article! Aurora 440c 3.6 x 0.625 in 1.6 oz. Here are several basic features to look for when you buy a flame starter. 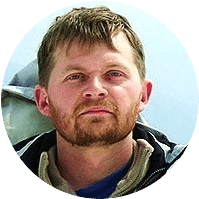 After going over the features, think about when and where you’ll be mostly using the fire starter – you may want to decide beforehand on how you would mostly use the product to save you the cost and the wear of the item. The weight and the dimensions of the product you’re buying are very likely the first things you’ll want to pay attention to. 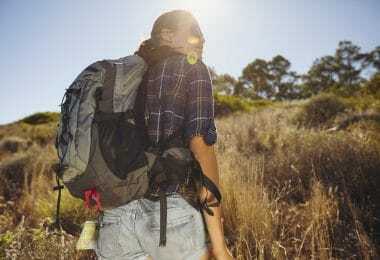 Considering the number of items you’re carrying around on a regular camping trip, you’d want to minimize as much as possible on the weight you’d have to carry on your back. Most fire starters are lightweight and some may even fit in a pocket. However, there are also heftier items available in the market – pay attention to the dimensions so you don’t accidentally end up with a bigger product than what you’ve intended to. It’s for the best to consider your needs in terms of how often you go out and how long would you be using the lighter. For instance, beginner survivalist would mostly need a basic tool which is lightweight and short; however, more advanced users may look for extra features and wouldn’t mind carrying a bit of extra weight to get that. The next important thing to think about is the grip of the fire starter. Don’t forget that sometimes you may need to use it in colder weather or even rainy conditions. As the case may be, it is common to lose your grip while holding the rod. Even though most products feature cross-hatched design for a firm hold, pay attention that yours allows for a firm hold, especially if you’re a beginner regarding fire starters use. However, on the other end of the spectrum is that even though it shouldn’t be slippery, the design should still allow for a smooth and easy grip – you wouldn’t want to use something that feels uncomfortable. On top of that, make sure the product is hand-safe and would not cause any cuts to your skin. The number of strikes you get with a fire starter may be a key thing to make or break a buying deal. Some products offer a larger amount of strikes while compromising on other features, while others offer fewer strikes but include other helpful items as well. There are highly durable strikes that can last up to 20,000 strikes – those would be ideal for professional and experienced survivalists who spend most of their time outdoors and wouldn’t want to spend much time worrying about getting a new fire starter on each trip. If you’re starting out, and you just go hiking once or twice a year, brands with 1,000 to 3,000 strikes would be just as fine. The weather in which you’ll be using your fire starter may largely influence your decision in the end. Even though some fire starters may work well no matter the weather, it could be for the best to always pick one according to the climate you’ll be camping at. Depending on your needs, there’s a variety of fire starters from which you can pick – most of them can be divided into fire starters made for dry, wet, or snowy conditions. In order to save both time and money, you may want to know beforehand in what climate and in what place you would mostly use a specific type of tool. So if you’ll be camping in a place that gets a lot of rain, it could be for the best to skip basic fire starters and instead look for products that won’t leave you disappointed on the rain. Last but not least, some models may give the user a few other additional benefits. 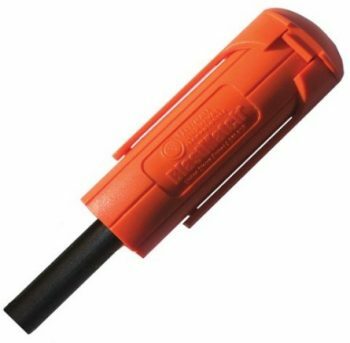 Some of the other features to look for in products are a blade, protective case/compartment, tinder, lanyard, cap, whistle, SOS instructions, push-button, safety against accidental sparks and so on. Even though it’s not extremely important for a fire starter to have an additional feature to it, getting one that has should save you some room in your backpack.Bearing all of that in mind, we’ll be moving on to the reviews of the top fire starters available on the market. Here are eight of the best items to get you started. Description: The Ultimate Strikeforce Fire Starter has been considered by many hikers as one of their top choices – it has even been featured on several shows and was even recommended by Dave Canterbury. 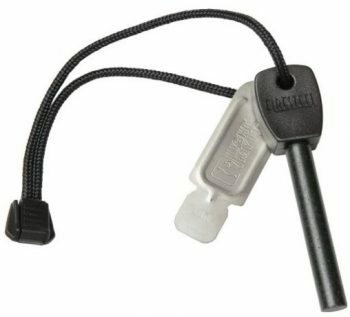 The fire starter has a lightweight design, which makes it a great introductory survival item for hunters, backpackers, and campers. If you spend most of your time off road, with varying weather conditions, this product is an essential item to bring in your pocket. It has a beefy steel striker and special flint bar alloy, which works well even with a thousand times of use; even so, it creates sparks three times hotter than your ordinary match. The striker’s thick and small rod makes it easier to hold, which could be the primary purpose of the design; but, since it is modestly limited in size, it may have some tendencies to break in continuous strikes. The shortened rod, however, limited the volume of sparks, which allows a faster way to light a fire. Overall, it has a solid build, thickly cast as a quality flint. Still, others may find it a bit bulky and hefty. Other features include the visible orange safety, the bottom storage compartment for waterproof matches and the accompanying chemical media flame starter. The lasso holds the cap/striker so it will not be misplaced; although it appears shorter which could make it difficult for beginners to hold. Related: Apart from a fire starter, carrying the LifeStraw Personal Water Filter could prove as useful on trips when access to clean drinking water is somewhat limited. Renowned for filtering out 99.9999% of waterborne bacteria and 99.9% waterborne protozoa, you can filter up to 1,000 liters of water without worrying for infections and diseases. The straw is light enough to fit in a pocket and could make a great addition to any survival kit. 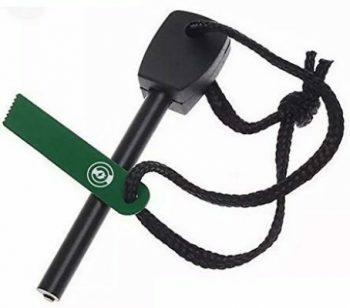 Description: For all of those looking for a flame starter with a survival kit, the Smith & Wesson Fire Striker Survival Kit comes along with a small bag, so this allows you to easily pack it along with your other stuff in the bag. This striker is small compared to others, but solidly built and compact. More so, that it will take less space in backpacks. The hollow handle would appear to be narrow for most people, but should keep the striker in place; so make sure to keep everything in the accompanying small box so nothing is lost. The price of the brand is a great deal, with the kit added more as a bonus item. 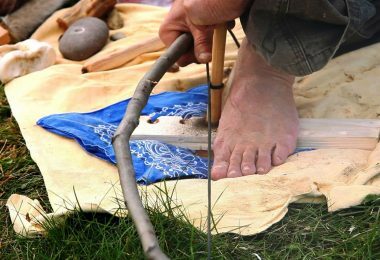 As with the use of the striker, learn how to use it in your backyard, before going into the wild because you might have a hard time to hold the rod the first time. It is advisable to learn to use it in advance in different weather conditions with different types of tinder. 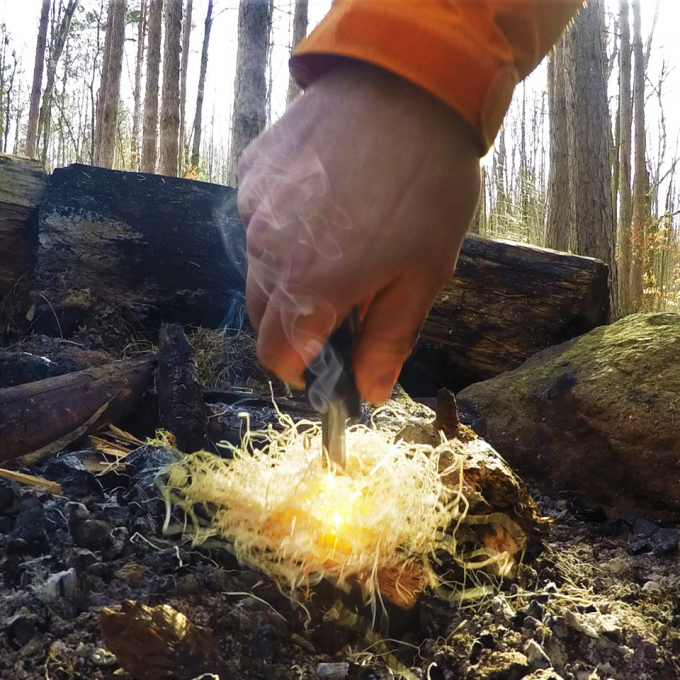 The concept is straightforward – scrape the Fire Striker to produce flames – however, learn in advance how to properly hold and aim the sparks into the tinder, so you’ll have an easier time when you’re outdoors. It would also be helpful to learn how to use the striker in windy, snowy, and rainy conditions, not just in dry settings. Related: The DATREX Emergency Water Pouch is a handy thing everyone should keep in their survival kit – it’s small, light and could easily supply you with drinking water whenever you may run out of it. The pouches are durable enough to withstand temperature variations and have a shelf life of up to 5 years. Description: The Holland Lightning Strike Fire Starter brings you a basic survival kit with the striker mold and cap giving you the possibility to direct the sparks into the tinder. This product has a capacity of over 20,000 strikes, but you can buy refills online. Also, you can replace the rod with the 60 millimeters or 6-centimeter rod. It has a 7.5-inch dimensional length. Another notable feature is the aligned steel channel, which provides a big volume of sparks, for those with little practice or even for beginner campers. The Lightning Strike brings in a large plume of sparks, which is generally concentrated at the tube’s end, to create a hot drift of blaze at the gap. If you prefer, you can position the aperture into the spot where you aim for the ignition to start. It is painless to hold the position and maintain the contact. For some people, notably for first-time campers, the cord at the end near the tinder would need some effort to pull. However, the great news is that it gives you that hot ball of sparks, allowing your tinder to fire up and ignite faster. Related: The Potable Aqua Water Tablets come in a pack of 50 tablets, which is enough to treat almost 25 quarts of water. The package is small and is almost ideal for any hiking, backpacking or camping trip where you’ll want to get quick access to clean water. Each tablet takes around 30-35 minutes to work. Description: The Boker Plus 09BO778 Fire Starter should make for an amazing buy for most users. The producer of high-quality tactical pens, Boker Plus, worked on several improvements on their fire starter. A feature they included is a 4.75-inch blade, a survival kit essential for intermediate and experienced campers. The included metal striker easily allows you to scrape off the chips on the built-in magnesium rod (whereas the extra kindle) and helps ignite intense showers of small flames and sparks. The also includes an aluminum thread container, along with a built-in compass and a checkered design pattern for better hold and grip during slippery times. It additionally has a 50-millimeter ruler and a bottle opener, attached through the chain. 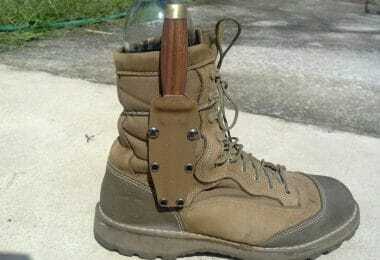 However, the bottle opener seems to be an added tool, not intended for the survivalist. Overall, the sturdy build and construction along with the bonus blade make a great option. Related: The ThorFire LED Flashlight is very likely going to prove as a fantastic addition to your backpacking and survival gear. The flashlight doesn’t need batteries to work and is powered only by solar power and with the hand crank. At the same time, the device is small and light enough to be able to fit in whatever kit you’ll need it to fit. 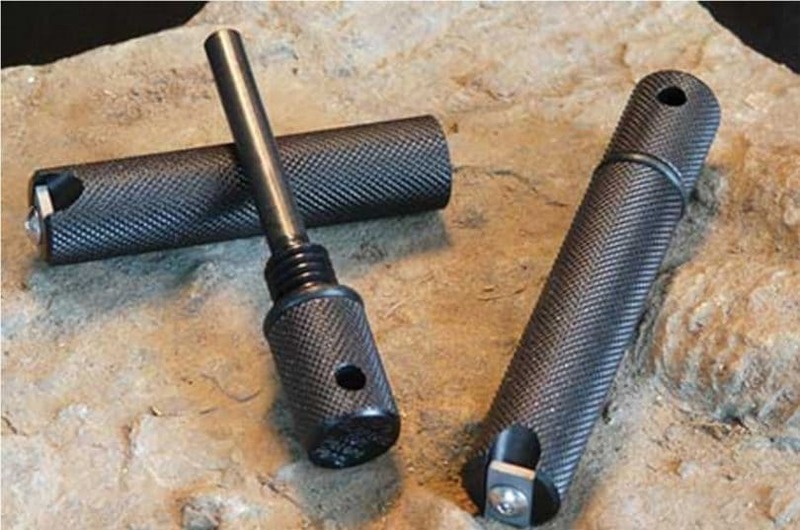 Description: Another product from Ultimate Survival Technologies, the UST BlastMatch Fire Starter provides a fairly operational and simple flame starter tool. It can generate as much as three times heat compared to standard matches, with a general shelf life lasting up to 4,000 strikes. 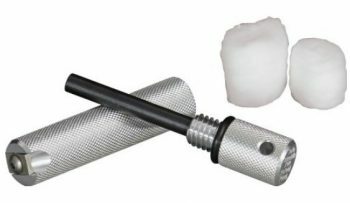 Included in the product are the tungsten carbide striker and patented flint bar – a highly functional rod that creates and focus sparks into the tinder, working even in wet, damp, or dry conditions. It also has a locked-in waterproof protective cover, which basically prevents incidental sparks from happening while the rotating bar, spins and rotates evenly, which maintains the item for an even wear and tear. The casing makes the whole item a bit heftier, notably if it is attached to the lanyard around your neck. In several tests, it can ignite good quality sparks on several types of tinder though you can also use some wet fire tinder. You can rotate the bar 360°, so you can evenly use the product while the safety button helps you avoid accidental striking and creation of flames. However, it may take some knack and even some practice so you can properly create enough pressure to fire up the sparks and lit the fires you need. A good feature is that it does allow you to hold the tool with just one hand, so it basically frees your other hand to cup and cover the kindle from the wind, letting you fire start some sparks even in windy conditions. Related: The UST Wet Fire Tinder is an excellent addition to their fire starter. It comes in a pack of eight cubes and it actually offers a longer burn when wet, an incredible feature considering the price. Each cube is individually packed in a leaked-proof formula, so you could easily grab as many as you’d need on your trip. Description: The Aurora 440C Fire Starter is manufactured and designed with a fully hardened striking steel blade. The sturdy rod is well-built and can be held by any type of hands. Still, the design helps prevent breakage in case it slips and drops from your hand. A lanyard can be attached to the loophole, which allows you to keep it close by if you choose to connect the fire steel to your key chain. It is a hard-built steel that comes along with an anodized aluminum case, which helps to protect and keep the flint dry. A drawback for the 440C is the cross-hatched design pattern. Though it improves and helps with the grip, the slightly sharp edges are a bit cut-sharp. You may want to file these edges until it’s a bit smooth enough to remove any risk to cut your hand, damage your bag, or slit your pocket. The rough feel may be too much for some people, though it may have been designed as such to enhance the grip. You may also notice the striker alignment as a bit out of position compared to others, so you need to have some caution to prevent the sparks from hitting your knuckles before they hit the tinder. Related: The VISM Utility Pouch may be a good option if you’re looking for a pouch to keep your basic survival kit at. Even though it comes at a low price, the pouch should be strong enough to withstand severe conditions while not letting you down at the same time. The pouch features four different – and separated – storing compartments. 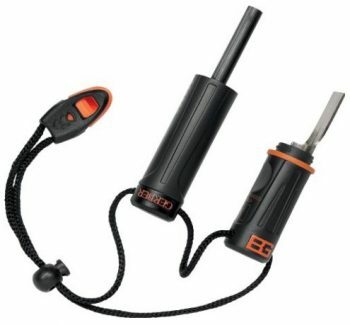 Description: The Gerber Bear Grylls Fire Starter is bigger but more optimized for survival hiking and camping. 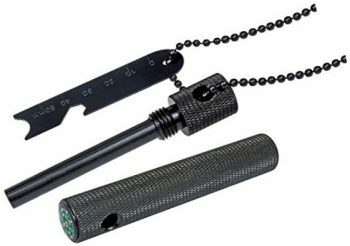 The metal striker and Ferro rod also include a whistle, in case you need to make survival calls and sounds in case you get into a trap. Whereas you can also attach a lanyard to keep the tool within your sight at all times, so it doesn’t get lost even in long walks, hikes and rocky climb. The product also includes an Air rescue and SOS printed instructions, for reference in case you’re in the direst situations. At any rate, the metal case has been manufactured to be waterproof to withstand rain or snowy weather conditions. 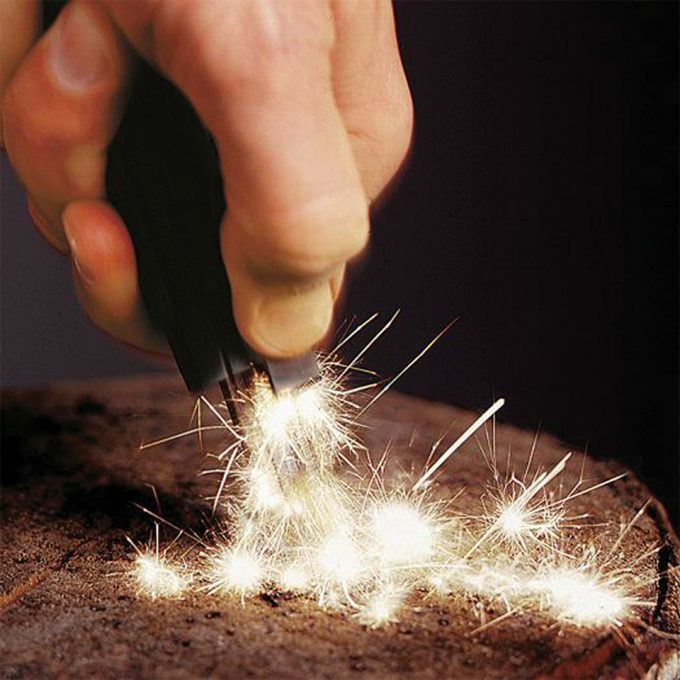 The protective case helps prevent moisture from entering the tool, allowing you to easily start a blaze, with several instantaneous sparks from several strikes. The cap has enough space that lets you put in a small tinder, such as a cotton ball, which makes you prepared and ready at all times; so just keep that in mind. Overall, the item is a good product due to its watertight, compact, and sturdy features. It is generally a hand-safe tool, as it is fairly comfortable if you hold it for a long time. Related: The UST SplashFlash LED Light is an amazing addition to any survival kit. The flashlight is waterproof and submersible at the same time, meaning water won’t do any damage to it. It operates in several modes, such as a steady-on mode or an SOS flashing mode. The case is impact resistant. 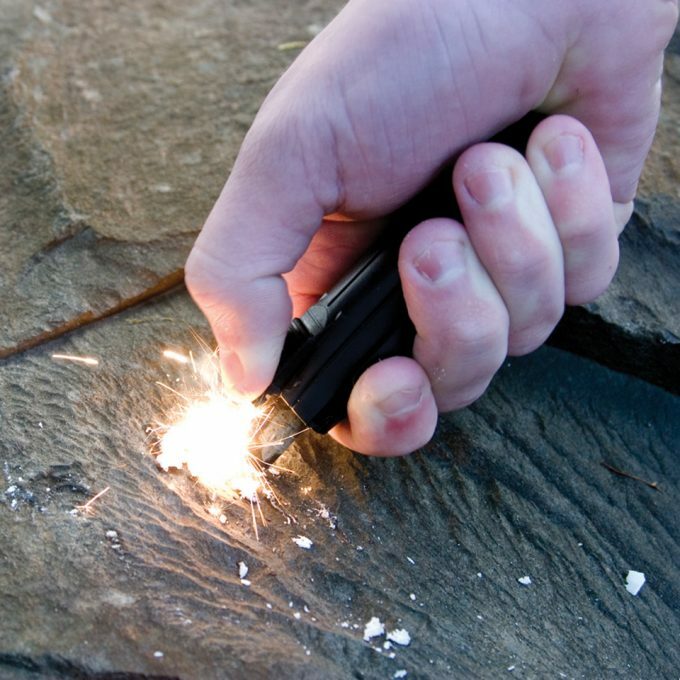 Description: The Light my Fire Original Swedish FireSteel Fire Starter can last as long as 12,000 strikes and can provide up to 3000°C fire sparks- some factors that you want in very cold temperature settings and snowy environments. For hikers who don’t mind spending time camping out in Alaska, Winnipeg or the Swiss Alps, the blaze starter even works when cold and wet. 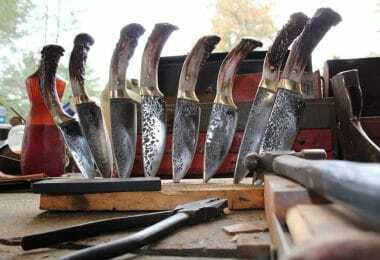 The Swedish Firesteel is relatively lightweight at around two ounces. Even more, the bright spark can even be used as a heat signal in emergency situations. It is available in Oak, black, and even Barbeque model handles. This item can last for several years, even if you attach it to your keychain, so it will work just fine after long periods of storage. However, don’t forget to keep a dry lint somewhere in your bag, as it can help you quickly start and fire it up with a couple of strikes. If you tend to go in places with cold climate conditions, you can use the tool even if it gets wet. Just scrape it with your knife, or any steel you have, to produce a hot blaze of sparks. Related: The Meeruz Hydration Pack with Water Bladder is a great addition to your camping kit and it comes with a water purifier straw, which means you could drink out of rivers or streaks in a time of need. The material of the backpack is water resistant and should make for a pretty durable wear. Whichever item you decide to buy, you may want to try them first for a couple of days before you actually go out into the wilderness for an extended period. This is especially true for beginner backpackers and campers as you may want to get a good feel of the product. In case you have some experiences using the above product selections, don’t hesitate to share your thoughts and reactions in our comment section. Feel free to let us know how the flame starters proved to work for you! Hiking In Jeans: Can You Get Away With Denim Outdoors? DIY Camping Spice Kit: Spice Up Your Adventure!